Bijon Dutta obtained an M.Tech. from Indian Institute of Technology, Kanpur and Ph.D. from Indian Institute of Technology, Bombay in Mechanical Engineering. Presently, in the grade of Distinguished Scientist, he is also Head, Computational Mechanics Section, Bhabha Atomic Research Centre and a senior professor in Homi Bhabha National Institute (HBNI). His research interests includes constraint dependent fracture mechanics, micro-mechanical modelling, probabilistic fracture mechanics, multi-scale material modelling, on-line creep-fatigue monitoring system, high-performance computing, nuclear fuel pin modelling at high burn-up and modelling of irradiated materials using MD and DD simulations. He is also coordinator of a multimillion dollar safety-related research program for his department. He has authored more than 250 research papers which includes 71 papers in peer-reviewed international journals. 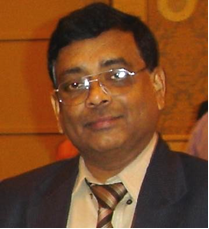 Dr. Dutta is presently guiding nine Ph.D. programs. He has received the Technical Excellence Award and Homi Bhabha Award for Science and Technology in the Department of Atomic Energy (India), and is a fellow of the Indian National Academy of Engineering.